It is odd to be back in the fray after one of the most decadent weeks I've had in a very long time. I graduated on Monday (where Bobbi Brown accepted an honorary degree! Random trivia: Bobbi Brown went to Emerson College as an undergraduate), and brought my parents around New York, Niagara Falls, and took a (sort of embarrassing but super fun) Segway tour through Washington, DC. I wanted to look at more memorials (other fun facts: I actually have a minor in Visual Studies and the Arts and took a class on urban public art in my final year) and visit more museums and was really excited to see all those works I've only studied on screen and paper, but alas my family was less amused by twisted colored metal and odd shapes on the grass. Perhaps I'll return to DC anon. It is architecturally a breathtaking city. After my parents left, I spent the entire weekend quite guiltily indulging in, well, fun that I haven't had time to have for the earlier part of the year. I spent the past two days in equal amounts of playing Diablo III, watching Mad Men, and reading The Clash of Kings: A Song of Ice and Fire. Imagine my alternating fist pumps to killing decayed monsters, Peggy Olsen (and goodness I want to move like Christina Hendricks), and crying "Winter is coming!!" to the stubborn warring kings. It was such a good weekend, but once school ends vacations become short. And unemployed graduates need to find jobs (sigh). I figured a quick one will do after a week of absence, and I checked to make sure this was still available before I posted it. 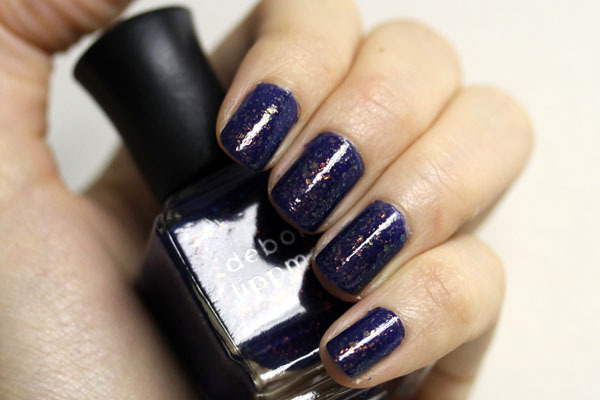 Deborah Lippmann Ray of Light is part of their spring release, an intriguing confection of indigo navy polish with what looks like copper flakies in the bottle. On application and closer inspection, the flakies are actually red/orange/yellow/green, though when directly in the light it reflects copper. The indigo navy base is jelly-ish, and the formula seems to be thicker than usual, so it was not a breeze to apply. It requires two coats for full opacity. I received many compliments when wearing this color, and wore it a full five days with nary a chip. It's one of the more intriguing colors that came out for spring, and if you don't mind suffering a little during application (and have an ardent weakness for flakies), I say get it before it's gone! Deborah Lippmann Ray of Light retails for $18 and can still be found on nordstrom.com and neimanmarcus.com. Congrats on graduating! I actually live...very very very close to Emerson College LOL. Why hello there, neighbor! The nail polish is gorgeous btw, I loooove flaky ones. This is a gorgeous color. LOL. I like indulging in TV dramas too. Congratulations on your graduation! What a great accomplishment :) Here's to a bright future for you! Love the nail color and glad you're back - missed your posts! I've seen this in person but couldn't swatch it because I was wearing nail polish that day. It looks really interesting in the bottle, but I've heard the formula is too thick and on some people the complexity doesn't translate too well. I guess it's a hit or miss, and I'm glad it's a hit for you! Sabrina- Thank you very much, Sabrina! And congrats again on The Beauty Look Book's 3rd birthday! Congratulations :) It must be nice to be out of school! I love the colors of that polish. However, I have such a difficult time applying thick polishes, I just don't know if I'd spend the money. Despite that - 5 days without a chip is friggin' miracle for me! Mine chip so easily and it seems to get worse when I use OPI polishes. It's so sad! CONGRATS CHEEKZ!!!! So happy for you!! Sounds like you had a great time! I love this one! I haven't seen it here yet, hopefully soon! Congratulations on graduating! I live right by Emerson! 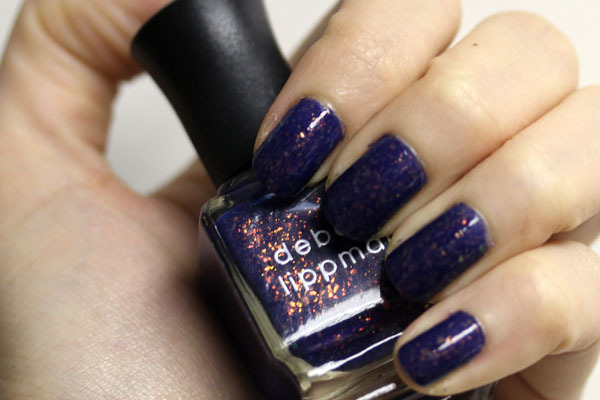 And I really love this polish, so pretty! Yes, winter is coming! Fist pump! Big hugs and congratulations on graduating :) 5 days of chip-free wear is amazing, and so is the color. So what did you major in, if you don't mind my asking? And I agree about museums, I've had so much fun visiting them after Art History. It's like seeing old friends again! Anonymous- Thank you! I'm still vacillating between cities :) definitely aiming for NYC for the job hunt. Sidney- Thank you! Nice but daunting :) I agree about chipping. And sometimes it's just a lucky bottle of polish that makes it last. I'm wearing RBL Aqua Lily now and after NINE days it still looks perfect. Makeup Morsels- Ahaha I can't decide whose side I'm on. I'm like Winterfell! Then Dragon Queen! Then oddly rooting for Tyrion as well. I spent the past two days in equal amounts of playing Diablo III, watching Mad Men, and reading The Clash of Kings: A Song of Ice and Fire. His response: I want to marry her. I most indisputably will make certain to do not omit this website and give it a look on a relentless basis. I don't drop many responses, but after reading through a few of the remarks on this page "I'm Back! 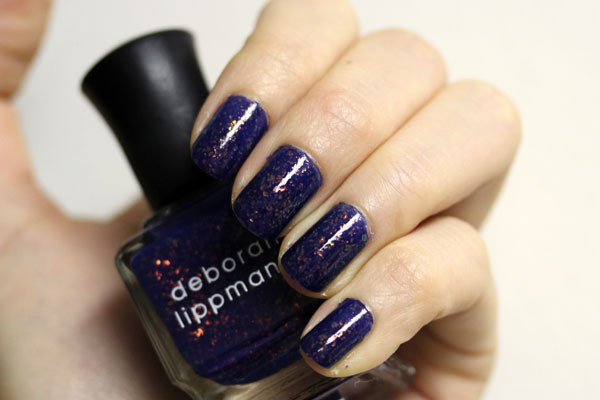 + Deborah Lippmann Ray of Light". I actually do have a few questions for you if it's allright. Could it be only me or does it look like a few of the remarks come across like they are left by brain dead individuals? :-P And, if you are posting at other online sites, I would like to keep up with you. Would you make a list of every one of all your social pages like your twitter feed, Facebook page or linkedin profile? Greetings! I've been reading your web site for a long time now and finally got the courage to go ahead and give you a shout out from Austin Tx! Just wanted to mention keep up the excellent job! more well-liked than you may be right now. You're so intelligent. You already know thus significantly with regards to this subject, made me in my opinion consider it from numerous numerous angles. Its like women and men aren't interested until it's something to do with Woman gaga! Your own stuffs great. At all times care for it up!